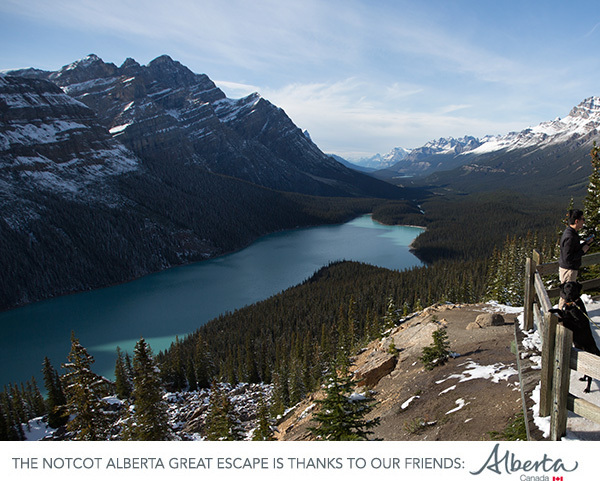 This post is part of our special NOTCOT Alberta Great Escape series thanks to our friends at Travel Alberta. In Part I, Shawn, Bucky, and I are loaded up in the NOTFZJ80 spending a week in Alberta roadtripping, camping, and exploring all that we can fit in… follow the series here to see what inspires us along the way! I know, i’m jumping around a little, but with so many pictures and experiences to share with you guys from this Alberta adventure, i’m working through it bit by bit! 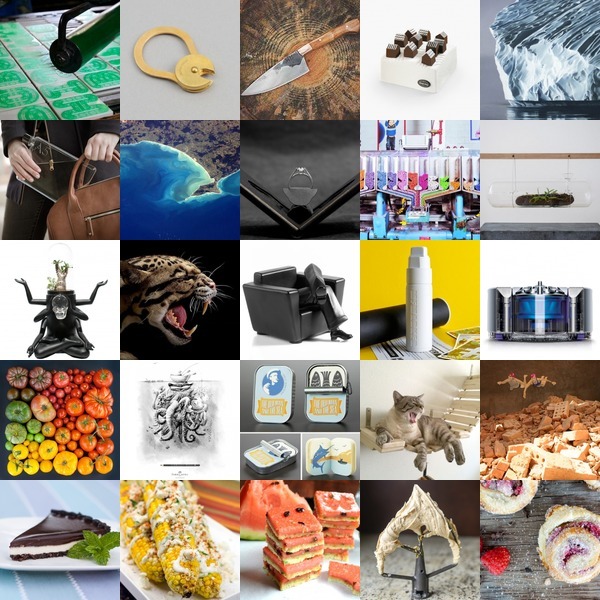 The most inspiring things to me have always been exploring nature and art+tech+design. So while exploring all that Alberta has to offer (or what is possible in a mere week with such a HUGE province)… when we were heading out of the Alberta National Parks to Calgary, I heard about Beakerhead, a “smash up of art, science, and engineering”… which is right up our alley! They describe it as when Calgary turns into a hands on laboratory - “it’s a time and place where engineers show their creative sides, and artists get technical, where science hits the street, and everyone gets ingenious.” Throughout the week, there were workshops for kids and adults, engaging talks and performances, and it sounds like all around playful inspiration! They even had “Canada’s first sustainable energy ferris-wheel-turned-dining-room. The 16-bucket wheel gently rotates while diners are treated to a multi-course molecular gastronomy meal created by esteemed Calgary chef Nicole Gomes, a contestant on Top Chef Canada,” called the Periodic Table - unfortunately all the tickets were sold out! 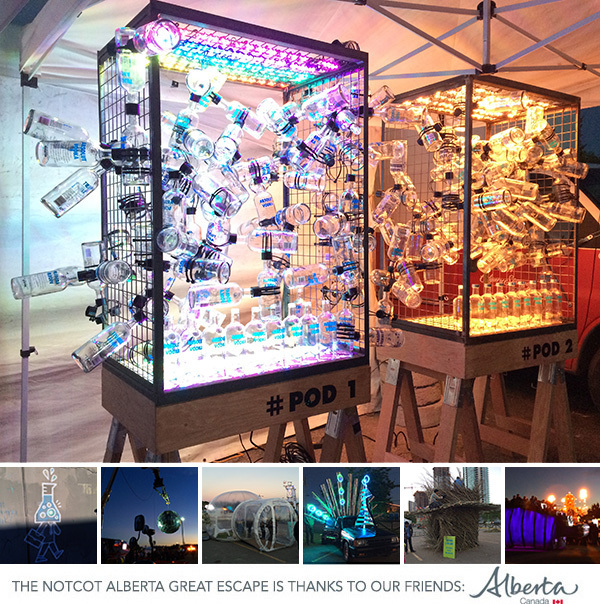 We managed to get back to Calgary just in time to see the displays at Little Big Street and Beakernight. They felt a bit like a mini Makerfaire/Burning Man/Design week combo of sorts with a Calgary flair. Even The Uncommons (which we just featured) had a pop up shop in a Pod shipping container! 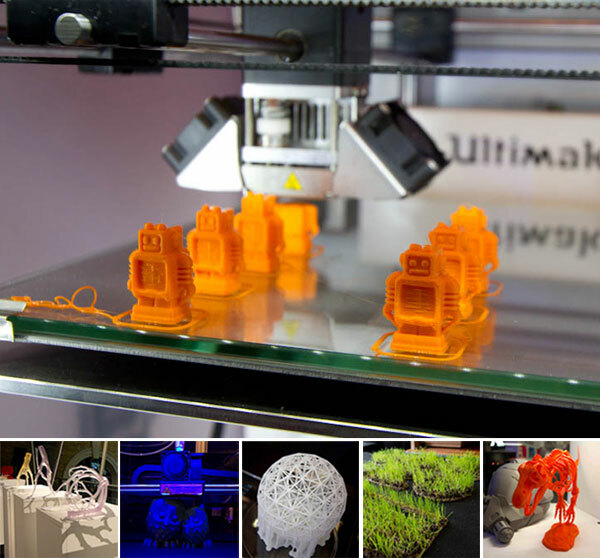 There was a huge discoball on a crane, a structure made of sticks, an inflatable living room, interactive/3D printed Absolut installations, a rideable hippo, a flame shooting octopus and more… take a peek at what we found on the next page! This trip I may have found a new favorite color: that magical Glacier Water Blue! My first taste was the incredible Moraine Lake. 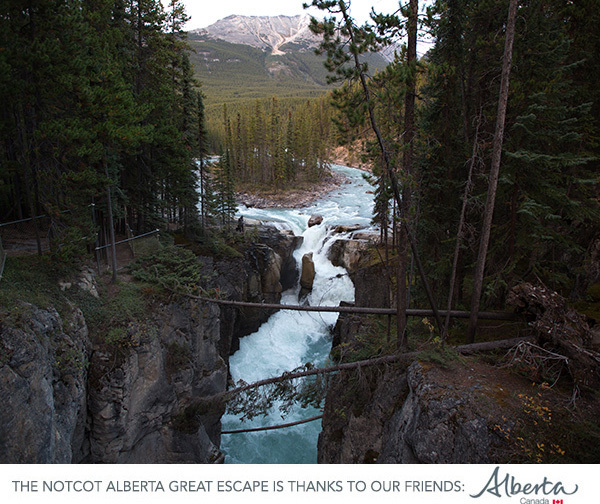 And then i’ve shown you the powerful Sunwapta Falls! Well on the drive up the Icefields Parkway from Banff National Park into Jasper National Park, almost anytime we saw the word lake/creek, we tried to pull over and check it out. Sure, it made the drive a bit slower, but each and every one was worth it! No matter how many we saw, the color really doesn’t get old. The varying shades of minty turquoise of sorts… a greenish robin’s egg blue? a saturated Tiffany blue? As for what causes the unique colors, it comes from the light refracting off the rock flour suspended in the water from the melting glaciers. It varies from lake to lake, depending on the not only the rock flour, but also the lighting/weather/time of day… but the color is always spectacular. See some of the incredible Glacier Water Blues we encountered on the next page. Sunwapta Falls - another favorite so far that I definitely need to get back to next time we’re in Jasper National Park (Notice, we haven’t even left, and i’m already planning a trip back? )… We debated whether we were losing too much sun to pull off when we saw the sign, but decided to rush over and see what we could anyhow… and WOW. So worth it, though I can’t wait to see it in bright sunshine! The glacier blue falls come down and around an island then rush into quite the drop before swooping onwards. I could have stood and stared at it all on the bridge for ages… also the tree roots that form steps down to the falls are mesmerizing in their own right. Check it out on the next page. The BLUE! That Glacier Water Blue… to be honest, I thought most people’s pictures were over saturated or photoshopped, but no. It really is THAT blue. It’s amazing how quickly the weather changed - from our snowy adventures at Spray Lakes to heading up into Banff National Park. My first stunningly glacier blue lake was Moraine Lake. We’d heard rumors that it is even more breathtaking than Lake Louise, so we detoured over first, and WOW. It is AMAZING. And beyond the lake views as you wander around… the Chipmunks! I’ve never seen such chubby little chipmunks run right up to you. Even crazier, they run up to BUCKY! And stand up in his face. You’d think a pup like him would go after it, but when it came right up to HIM, he had no idea what to do. And once you wander up past the chipmunks, the view down at the lake is just incredible. It was hard to leave Moraine Lake, but I had to keep reminding myself this was just the beginning! Check it out on the next page. 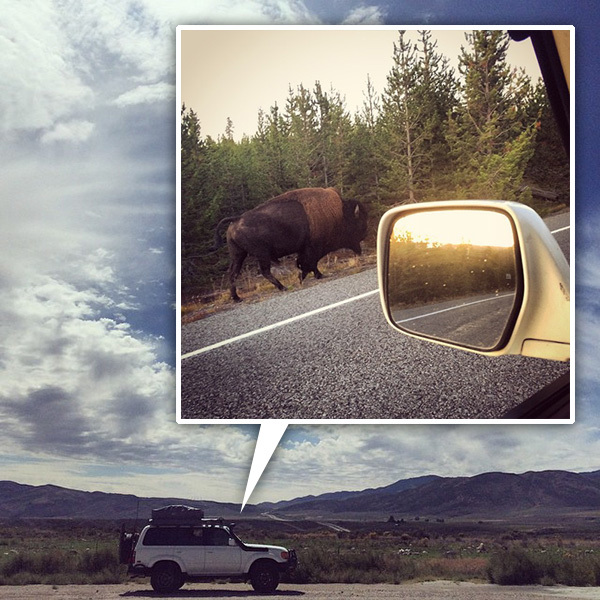 The one thing you can count on on a multiweek road trip is running into the unexpected. In this case the weather took a turn to the cold and snowy for a few days! Like wake up to half a foot of snow sticking kind of snowy… and that didn’t stop us from genuinely, excitedly trying to go find a camp site by Spray Lakes. The camp sites are THAT stunning just off the water nestled in the trees. But like in a fairy tale ~ we headed to dinner at the Mount Engadine Lodge around the lake, which appeared like an adorable Swiss chalet mirage through the low visibility of the snow and trees… and with dinner, they offered us a spare room and told us not to be silly instead. By the time i woke up and saw the inches of fresh powder everywhere, i think we made the right decision! 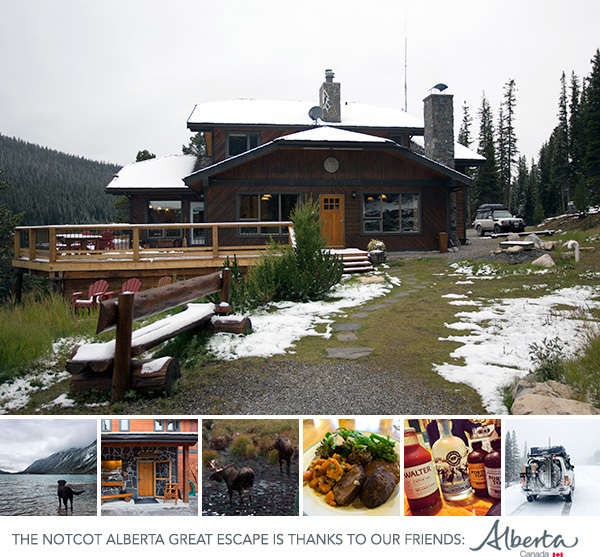 Honestly, there is something just magical about Mount Engadine Lodge. Beyond the adorable chalet style, the people both running it and guests immediately treat you like family as you curl up by the fire, play games, and join the communal dining area. The first thing you are offered is to get out of your wet shoes and slip on some colorful hand knit slippers. Then you hear “BEAR” and “MOOSE” and then “TWO MOOSE!” within moments of arrival… and it’s not joke. Staring out the vast windows overlooking the meadow, sure enough there is a mama and baby bear sauntering down, and two moose chowing down in the mud pit. Often you read things are “like the Serengeti for wildlife viewing”, but to pop in and have all of this happen so fast… magical! 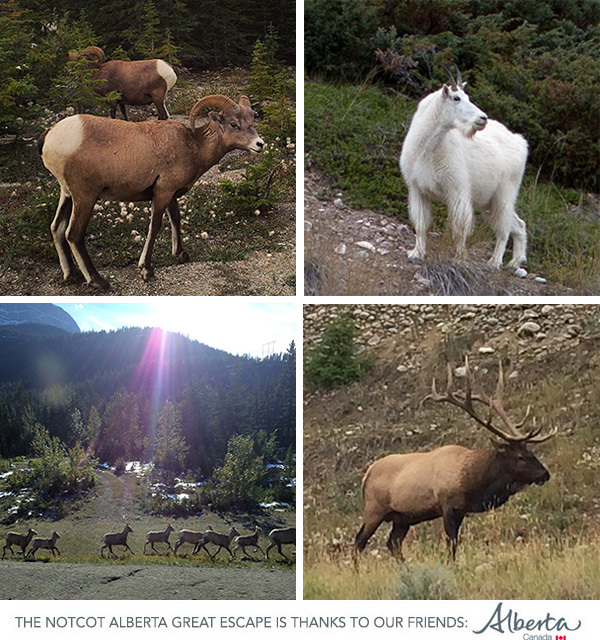 See our adventure to Spray Lakes, Mount Engadine Lodge, and the rather precarious drive out on the next page! Sounds silly - but even bouncing around on the road as I am now, my moments of zen still come from getting to lose myself in all the inspiration we’ve shared and found on NOTCOT.org. 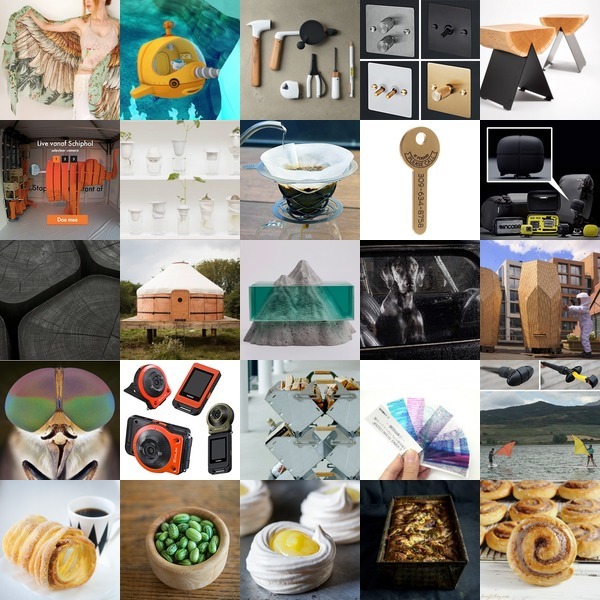 Above are some of our latest inspirations from NOTCOT.org and Tasteologie this week! Click the pics to find out more! I can’t even begin to sum up how much i’ve learned since Bucky joined us less than 2 years ago. We’ve all been learning a lot on this epic road trip… he’s been learning to take in all the newness, calm down a bit more with new folks, and adapt like a trooper to camping and hotels for the first time… and it’s our first serious trip with him. But along all of it - it also means less free roaming running around time for him to get his energy out and stretch his legs properly. SO - on unexpected awesomeness, we’re loving the Canmore Quarry Lake Dog Park. There’s a huge off leash area - as well as on leash trails surrounding it. And better than the beautiful land and views around it… the people! Who knew that pulling up our beast of a car with CA plates and having Bucky romp around with so many other big dogs would be such a great spot to connect with locals and travelers alike. Also crazy - we went two days in a row, the first with a little snow on the ground, the second covered in snow and snowing heavily! Both days you couldn’t stop Bucky from sprinting from end to end with a ridiculous puppy grin. Take a peek at the site and his giddy puppiness on the next page… and as we continue traveling with him, figuring out good off leash areas will definitely be high on the list. It’s been a while since i’ve popped into a store and found myself wanting things from almost every shelf! Well it happened! When in Calgary, you have to go see The Uncommons in Inglewood for awesome giftiness and designer goodies! While there were many of my friends and favorites on the shelves, what made me even more giddy was the amount i hadn’t seen! Amazing way to discover some local Alberta goodness. Sadly much of what is there isn’t on their website… yet! So it’s a store definitely worth popping into in real life. 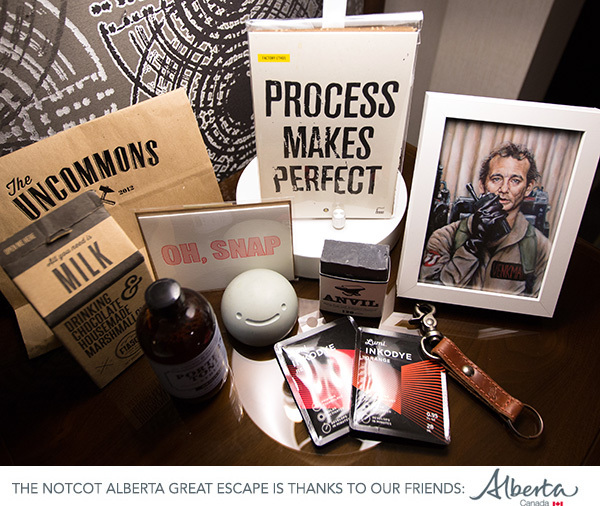 Take a peek on the next page for a look inside the store as well as the taste of Alberta they gifted us! We made it! We crossed the US/Canada border in the NOTFZJ80 with dog and all with no problems, and even finally got to make use of our passport cards. 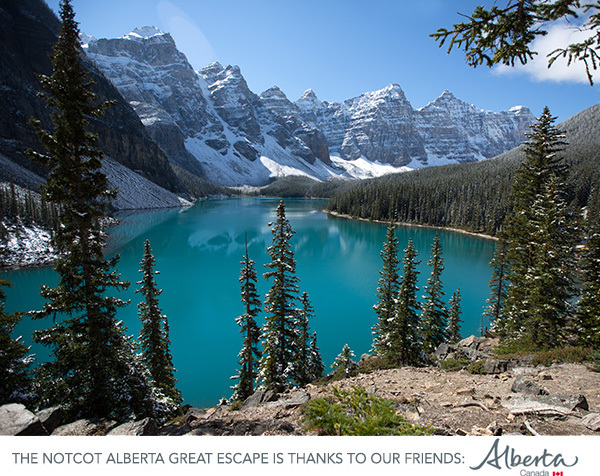 I can’t even begin to tell you how excited Shawn and I are to embark on the adventure we’ve dubbed the NOTCOT Alberta Great Escape. As you know, the NOTFZJ80 Project was all about building a rig that could take us to experience new things and get inspired in a whole new way. So when Travel Alberta asked us to come explore their province - and were cool with us not only roadtripping up from LA (allowing for some fun adventures along the way) but also bringing Bucky along as he turns 2 next week… we couldn’t say YES fast enough. After crossing the border, we headed to Waterton Lakes National Park, which is essentially the Canadian side of Glacier National Park. In fact, in 1932, the United States and Canada joined together to create the world’s first International Peace Park: Waterton-Glacier International Peace Park to commemorate the peace and goodwill our two nations share. In 1995, UNESCO even designated it a World Heritage Site. What more perfect place to cross over and start our adventure? 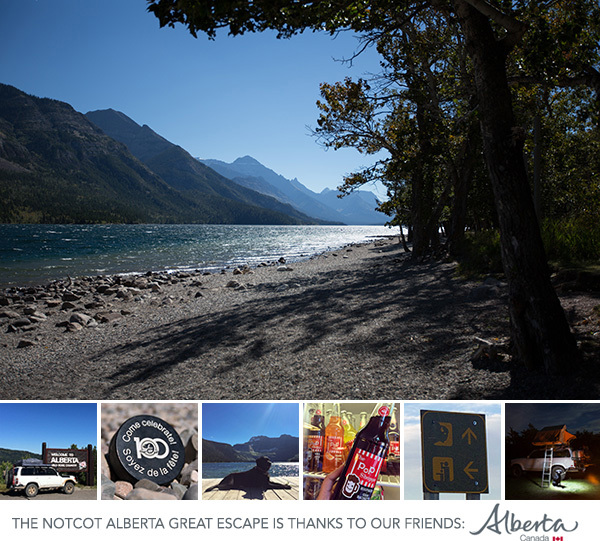 See what we found on our first day into Alberta on the next page - from Bison to stunning lakes, to Pop Shoppe, to our campsite and more! 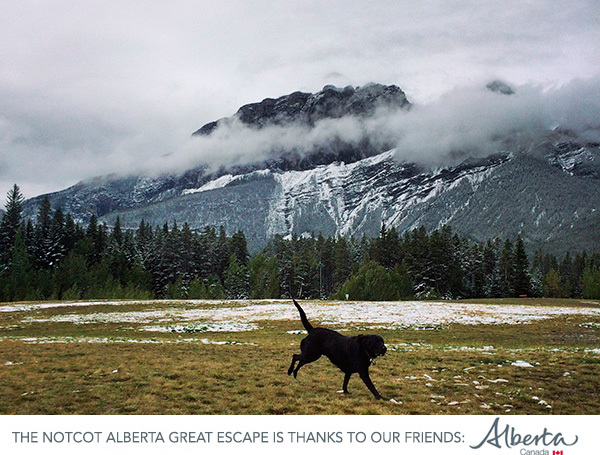 Almost a week into our adventure to go explore Alberta, Canada… and first time curled up in a hotel (now in Calgary!) to catch up and give you a proper update. As the last post told you, Bucky, Shawn, and I are adventuring north in the NOTFZJ80. A mix of remote roof top tent camping and hotels as we work our way around. Here’s the update from LA blowing through Las Vegas and Salt Lake City heading up into Yellowstone, around Montana, into Glacier as we got ready to cross the border to Canada into Waterton as our first Alberta stop. Here’s a peek at everything from what we saw on the road to the magical sites in national parks to roadside bison, sunsets, pasties (and cocktail pasties! 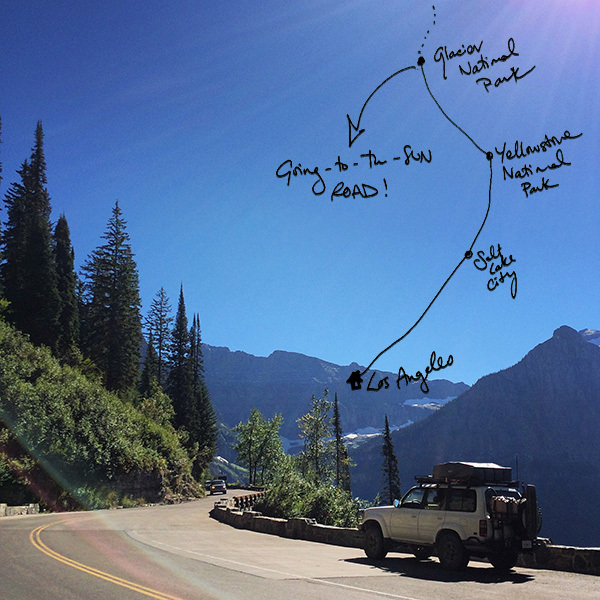 ), google map detours that turn into off road courses to get around highway closures, dozens of miles of dirt roads to get to the perfect camp spot by a lake, unexpected little towns, ridiculously good huckleberry pancakes and pie, and one of the most epic drives i have yet to experience (Going-to-the-sun Road! )… ready to get the quick version of the last few days? To the next page! On continuing this year’s trend of doing things i’ve never done… just knocked 3 more states off the list! 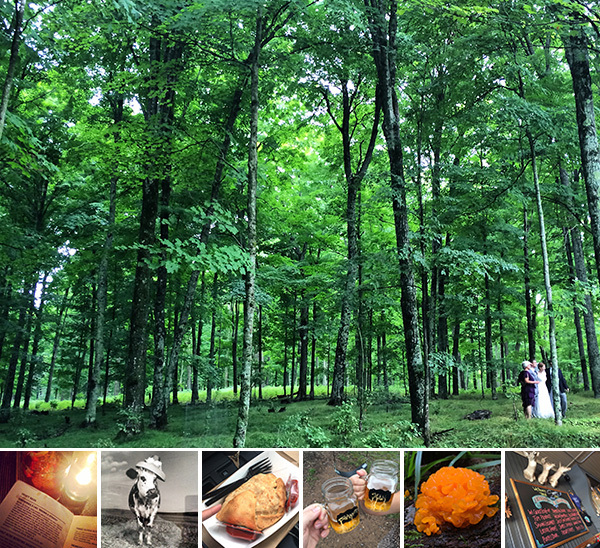 This weekend we flew into Chicago, spent a night, and road tripped through Wisconsin and into the Upper Peninsula of Michigan for a lovely wedding in the woods, with pit stops in Chicago, Sheboygan, and Milwaukee and explorations around Iron Mountain, Norway, Vulcan, Faithorn and more. Ready to see what inspiration we found? To the next page!